Like almost every kind of accessory in the drone industry, drone batteries have seen some huge advancement over the past few years. They went from being unpredictable, hard to read batteries designed to give maximum power, to Intelligent Flight Batteries capable of giving you updates on their status and warning messages during flight whilst maintaining the maximum output for your drone. But even with these developments, you still need to be careful and make sure you look after your drone batteries in order to maximize their functionality, lifecycle and generally stay safe. Following repeat questions from our customers, Heliguy Insider are looking at drone batteries and their maintenance to give pilots the most out of their batteries. Unfortunately, drone batteries require a lot more care and attention than the batteries you have in your phone or laptops. Keep reading for information on drone batteries, how to use them and general tips on battery preserving your batteries. The majority of drone manufacturers use Lithium Polymer batteries known as LiPo batteries. LiPo batteries are highly powerful and should be properly maintained to ensure safety for you and your aircraft. Since their initial use in the late 1980s, LiPos have developed a huge amount. DJI have developed a series of Intelligent Flight Batteries for their drones based on the LiPo battery format. Although they are packed with smart features, you still need to ensure you follow the below advice to stay safe and maximize the life of your batteries. Find out more about using your drone batteries and how to care for them below. 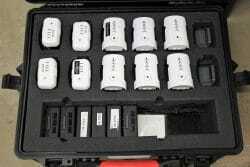 Let’s begin with some general tips on using the batteries in your aircraft. Start off by downloading and reading the manual for your specific flight battery and drone before taking them out for a flight. Make sure you understand the basic functionality before you fly. Pay particular attention to the section on the Intelligent Flight Batteries. Only fly your drone with a fully charged battery that is securely mounted in the aircraft. As part of your pre-flight checklist, you should ensure the batteries are properly fitted and charged to 100%. Never install or remove a battery from an aircraft when it’s turned on. Avoid flying your aircraft erratically. This includes sudden changes of direction or abrupt braking. This will quickly drain the battery as the motors will be working harder than they need to. Try to keep your operation to steady movements and slow braking for longer flight times. We understand that this isn’t always possible but for general drone use, you should aim to follow this tip. Make sure you follow the operating temperature guidelines found in the user manual for your aircraft. Flying in cold temperatures will reduce your battery capacity and warm temperatures may lead to irreversible battery failure. Some aircraft such as the Inspire 2 and Matrice 200 series have self-heating batteries but you must follow the temperatures in the manual. If you have multiple batteries for an aircraft, it’s recommended you cycle through your batteries and avoid using just one. Balance the pressure you put across your batteries. Labelling your batteries may help. At least every 20 cycles, complete charge and discharge the aircraft’s battery. This will help optimize the lifecycle of the battery. Unlike previous LiPo batteries, this won’t cause lasting damage to your battery as long as you limit how often it’s done. DJI batteries are shipped in Hibernation Mode. When you receive a new battery, you will need to charge it to 100%. This will bring them out of the mode for standard use. Batteries will also enter hibernation mode if completely drained for more than ten minutes. Again, follow the same process. Keep the connectors on your batteries, chargers and aircraft clear of debris and dust. The connectors can be cleaned with a clean and dry cloth or compressed air canister. Be careful when cleaning to avoid damage to the connectors. If you encounter a battery error, try running your battery down to 0% then recharging. Unlike previous LiPo batteries, Intelligent Flight Batteries retain some charge which helps avoid irreversible errors when discharging a battery. Keep reading for some general battery safety tips. Now you know how to use your LiPo battery, we’ll look at some safety tips you need to follow. It seems like quite an obvious tip but don’t use a battery with any known or visible damage including leaking and swelling. It could result in a drone crash or even worse and is simply not worth the risk. A new battery is a fraction of the cost of the drone, so just don’t risk it. If your battery comes into contact with water, stop using it immediately and don’t use it again. Allow the battery to dry in an open area then dispose of it following the below advice in the ‘Battery Disposal’ section. You should also keep in mind weather conditions such as fog and mist can result in water on your aircraft and batteries, so you will need to take care. If a battery ever catches fire, do not use water to put it out as this made spread the fire. Use sand or fire extinguisher designed for electrical fires. Charging your battery is a large part of battery care. Make sure you follow the below tips. Only use an official charger for your battery. You may be able to find cheaper versions online, but third-party chargers don’t go through the same rigorous testing as that of the manufacturer. You will also likely void your warranty so if you encounter any issues, you won’t be covered. Each different aircraft battery type has different temperatures you can charge them between. You will be able to find this in the user manual for your aircraft/battery. A general rule to follow is to charge at room temperature between 22 to 28°C. Don’t charge the battery straight after flying. Wait around 15 minutes to let the battery cool down before charging. DJI Intelligent Flight Batteries have four LEDs to show the amount of charge in a battery. 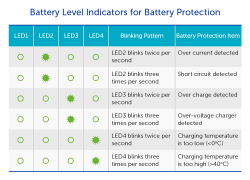 The below chart shows the meaning of the LEDs and the amount of charge in the drone battery. 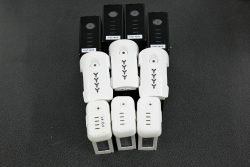 Further to the LED charge status, DJI Intelligent Flight Batteries LEDs provide updates on the health of the batteries including charging temperature, short circuit detection, overcharge detection etc. This will appear when charging the battery and should be used as a guide of what to avoid. Never leave a charger unsupervised, especially overnight or when out of the house. Although charging is significantly safer than it used to be, you should monitor the battery periodically just to be safe. Never charge your battery on a flammable surface. You can use a metal box or fireproof bag for peace of mind during charging. Finally, once a battery is fully charged, remove it from the charger. Intelligent Flight Batteries do have overcharge protection however, this will give you an additional protection when charging. The DJI GO 4 app is used with a number of aircraft to control DJI drones. In the app, you can also check the status of the battery and control different its different properties. 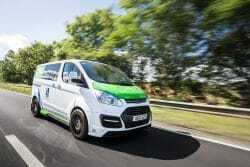 The basic settings allow you to check a battery’s voltage, voltage balance across all cells, temperature, remaining power, total capacity and the number of times it has been charged. With the cell voltage balance, all batteries should have no more than a 0.04v difference. If this is exceeded, there is an error with the battery which should be checked by an authorised repair centre. You can also check and set the critically low battery warning between 10% and 15% and the low battery warning from 15% to 50%. You can also enable and disable a drone’s RTH. The RTH feature checks the battery level available and will bring the aircraft back to its specified home point. The settings available in the advanced settings allow you to set the number of days for the battery to start to discharge itself. You can choose between one and ten days for this option. 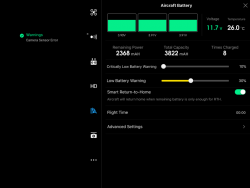 Further to the available settings and battery information, there are several warning messages the app will deliver when using the aircraft and battery. Overcurrent in Discharge – If this appears, don’t fly the aircraft aggressively. Over Temperature in Discharge – The battery temperature is too high resulting in the aircraft automatically reducing power to make the battery usable. Low Temperature in Discharge – The battery temperature is too low. This can be increased by landing the aircraft and running the aircraft’s motors or using a battery warmer with some aircraft. Cell Damaged – The battery cells are working abnormally, and you should stop using the aircraft immediately. To check whether these issues have previously appeared, select ‘History’ under the advanced settings. Alternatively, the previous flight of the aircraft can be watched through the app including GPS coordinates and any popups that appeared. Make sure you follow the information and warnings on the app. 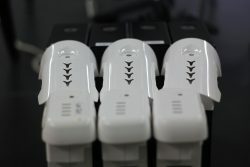 It can check details of the battery that visibly can’t be seen and is designed to keep your battery healthy. Dependent on the amount of time you’re storing your battery, different processes should be followed, however, some factors will stay the same. Store batteries at room temperature in a dry and ventilated place. Never leave batteries in the aircraft as a battery error could result in lasting damage to your drone. For added safety, batteries can be stored in a fireproof bag or metal case to avoid issues. Short-term Storage – Batteries should be discharged to between 60 and 80% if you’re not using them for between one and ten days. Long-term Storage – If storing for more than ten days, store the battery between 40 and 60%. Batteries should not be left for over three months without being charged as the battery life will be reduced. Intelligent Flight Batteries will automatically discharge after a specified amount of time. This can be done in the DJI GO 4 app. Never store batteries in vehicles other than during transportation. The conditions are usually too hot/cold and can cause damage to the battery. Travelling with drones is becoming increasingly common across the drone industry. Drones are being taken on holidays and trips for aerial photography and people are travelling for contracted jobs with drones. If you’re travelling by car, transport your battery in a well ventilated and fireproof case. Don’t carry batteries loose in a bag or pocket as this may cause the battery to short-circuit if the terminal comes into contact with another object. Follow the long and short-term storage guidelines we discussed above and remember that batteries should never be left unoccupied in a car. Heliguy Insider have a previous post about travelling on an aircraft with you LiPo batteries that can be found here. Aircraft such as the DJI Inspire 2 and Matrice 200 series require aircraft be flown with dual batteries for battery redundancy. In order to do this, batteries must be paired together. 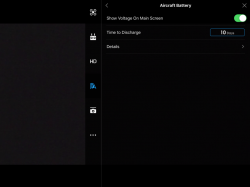 Batteries are paired through the DJI GO 4 app under the battery settings. Once in the battery settings, select ‘Get Paired Information’ to check which batteries are paired and pair new batteries. Select ‘Pair Batteries’ to do so in a matter of seconds. Once batteries are paired, it’s recommended the batteries are labelled for ease. You can change battery pairings if required however, this shouldn’t be done often. Try to keep the same batteries paired. In the UK, LiPo batteries are considered as hazardous waste and cannot be put in standard bins. Batteries should be taken to your local waste and recycling centre and put in their lithium battery bin. Transport in a fireproof bag for increased safety. If in doubt when you get to the waste and recycling centre, you should ask a member of staff for advice. It’s recommended you don’t manually discharge the battery yourself as damaged or faulty batteries may become volatile during discharging. It’s clear, care and maintenance of your batteries is necessary to help with the safe operation of your drone and increase the battery’s lifecycle. There have been some huge developments with drone batteries, but they are still a LiPo battery and must be properly looked after. Following the above information will help you get the most out of your batteries. Remember, the cost of a new battery is very low compared to the overall price of your drone. Don’t risk your aircraft with a faulty battery or one you’re unsure of. For any questions about your drone batteries or DJI or Freefly products, please contact a member of the Heliguy Team on 0191 296 1024 or email us at [email protected]. Keep checking back to Heliguy’s Insider Blog for more announcements, insights into drones and, of course, the latest news from the drone industry.